Robin Quivers...The 51-year-old radio personality credits the controversial Master Cleanser Fast — which can involve weeks of ingesting nothing except a lemon-juice and cayenne-pepper elixir—for her newly slim 145-lb. frame. But more importantly, she says the regimen is responsible for erasing the joint pain and fatigue that had plagued her for more than a decade. "I've never felt this good about my body before," declares Quivers, who likens her extreme dieting—she has fasted for 21 consecutive days on three occasions—to "a spiritual journey." Says Quivers: "It's just a completely different way to be." The change has been evident to those who know her. "She's a whole different person, "says Howard Stern producer Gary Dell'Abate, "I've been with her 20 years, and I've never seen her this happy and confident." In lieu of food, followers guzzle a concoction of fresh lemon juice, maple syrup, cayenne pepper and water. "But this wasn't about weight loss," says Quivers, who traces her health problems to steroid-based medication that she took in 1989 to regulate her menstrual cycle, "I was really trying to regain my health, and that's what it did." It took a rock-bottom moment before Robin Quivers would make a major change. 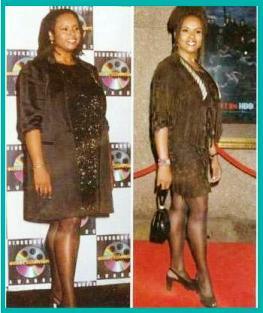 In September 2002, near her peak weight of 218 lbs. and in despair about the way she looked and felt, she grudgingly attended a friend's wedding. When she tried to make an early exit, "Rebecca Romijn-Stamos grabbed me and said, 'No! You've got to dance with us!'" recalls Quivers. "I thought I was going to burst into tears. I'd never felt so horrible about my physical condition in my entire life." One month later Robin Quivers came across her solution when magician David Blaine was a guest on Stern's show and raved about the Master Cleanser. Having tried dozens of diets, Quivers decided to go for it. "Downing her first glass of lemonade," she says, "I was like, 'It doesn't taste so bad!'" Still, "I didn't expect to be able to go 24 hours without food." Having since completed three such fasts, Quivers says she has a renewed appreciation for food: "I was eating a salad for the first time and going, 'Wow! This tastes like ice cream!'" Today, she drinks the lemon potion throughout the day, eating a dinner of salad or fish and the occasional drink or snack. "Sometimes my body says, 'I want sugar,' and I eat sugar," she says. "But my body doesn't need as much food now." These days she delights in shopping for her slimmed-down figure—"Now I'm a clotheshorse! "—and looking ahead to a potential talk show of her own. (As for Howard Stern, which has been yanked from several major stations, Quivers is sanguine: "It reminds me of being a kid in school—we're still being sent to the principal's office.") No matter what, Quivers sees herself maintaining her newfound health for good. "This is my way of life now," she says. "I don't ever want to feel the way I felt ever again." *Story from People Magazine, April 5, 2004 by Michelle Tauber, Mark Dagostino in NYC. NOTE: DO NOT try the Master Cleanse (Lemonade Diet) until you find out the exact steps of doing it. Most People don't last 1 day on The Master Cleanse. Robin Quivers managed to turn 24 hours into 21 days. If you want to lose weight successfully like her, you need to find out the common problems about Master Cleanse and how to avoid them. Raylen Sterling has written a book called Master Cleanse Secrets which had made The Master Cleanse "Doable" for people across the world. I strongly encourage your checking it out if you want to copy the Robin Quivers weight loss success with the lemonade fasting diet.